Michael Offutt: Oh boy the 2019 Genie in Aladdin has got some serious uncanny valley going on. 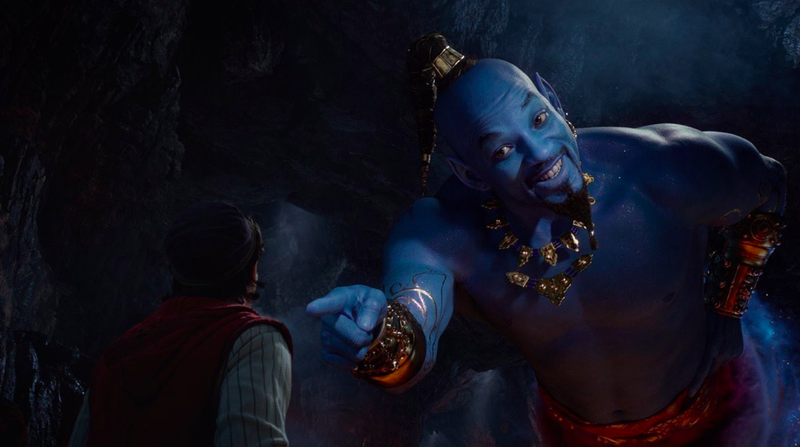 Oh boy the 2019 Genie in Aladdin has got some serious uncanny valley going on. The "uncanny valley" is a common unsettling feeling people experience when androids (humanoid robots) and audio/visual simulations closely resemble humans in many respects but are not quite convincingly realistic. My "go to" movie for this is The Polar Express, which (in my opinion) is a good movie but I can't watch it. It just bugs me too much. Applying this to Aladdin (the Guy Ritchie live action adaptation) based on only a one minute trailer is probably not all that fair. However, this "early" look that we got of Will Smith as "Genie" gave me that same feeling. I'm not an animator. I don't know how complex it is to give life to things like "The Genie" in Aladdin. But I wasn't bothered in this way by Doctor Manhattan in the 2009 film adaptation of The Watchmen. Maybe it's the glow? Genie should have a kind of glow around him that maybe could hide the uncanny valley just a bit, don't you think? In the least, they should do something to make Genie look more supernatural. Because...I don't know...this may be similarly unwatchable as The Polar Express turned out to be. I'm hoping that the effects still aren't done. Otherwise, it may be a whole new world of terror and screaming children. Check out the trailer if you dare. I feel the same way about Polar Express. It's the eyes. No matter how realistic the animated person, the eyes still appear dead. I am with you on that. The book by Chris Van Allsburg is a great book, great illustration. He also wrote and illustrated Jumanji. It is almost impossible for a movie meet expectations when the book is exquisite. Can Will Smith stand up to Robin Williams? We shall see. That's how I felt when I saw the trailer for that Alita movie coming out this week. I’ve read somewhere that alita’s Features were altered to make her likeable after initial feedback on earlier trailers were bad. Saw the movie and I really liked it. Interesting. Hopefully it's just early effects. But yeah, perhaps the technology isn't quite there yet for this type of animation. I like Will Smith, but that on-the-edge-not-quite-real kind of animation might prove too distracting for me. But maybe one of these days I should watch at least part of Polar Express 'cause I like Tom Hanks.